Happy Saturday! We're getting ready to head down to Amish country for dinner and some shopping with the fam. The only bummer thing is, though, that it's so much cooler here today - high of 65 and 2 days ago it was 90! Breaking out the jeans and long pants for sure! I am finding my stash low on boy birthday cards, so I used the ingredients from a card kit by April I received in a swap. It's out of my usual style, but I love all the glitter and it really does "rock"! I followed the sketch from Tuesday Morning Sketches this week. Most of the supplies were from a kit, but I added SU Going Grey cardstock. Image is colored with burgundy Stickles and a red Copic marker. Oh Colleen - this looks so good!! I love the guitar and the paper circles look like spotlights. This card ROCKS! haha! Thanks for joining us at Tuesday Morning Sketches. This is soo awesome.. my boys would totally love to receive a card like this! Very cool! 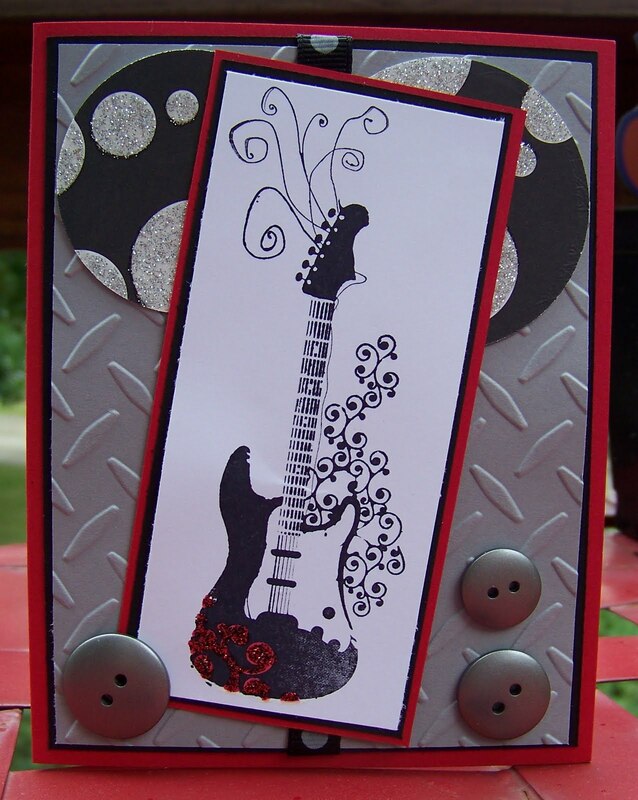 The metallic look is so perfect, what a great guys card!! I think this came out totally awesome...and when I first looked at the card I thought the "stuff" looked familiar!!! LOVE how you put it all together!